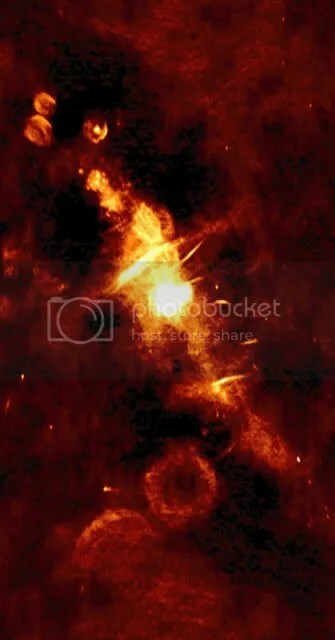 Sagittarius A* (usually shortened to Sgr A* so astronomers don’t have to type as many letters) is the Milky Way Galaxy’s supermassive black hole. A tiny ball of matter, weighing in at an estimated 4 million solar masses held within a volume barely ten times the volume of the Sun. Though some scientists would still tell you that its status as a supermassive black hole is unconfirmed, frankly, there’s nothing else that it could be! Sgr A* is permanently hidden from us by all of the dust clouds in the Milky Way. Fortunately, radio waves cut through dust like butter (metaphorically speaking), meaning radio images like this one can be captured. This 9cm radio image image was taken a few years ago (Kassim et al, 1999, if anyone’s interested), and it shows a lot of the structure of the galactic core. The bright spot in the centre is known as Sgr A (hiding the much smaller Sgr A* inside it). The double blob looking thing just up and left of it is the Sgr B complex — including the ever fascinating Sgr B2 cloud. What’s interesting about this image is that almost all of those circular objects dotted about are supernova remnants! The most likely explanation for these is that these were stars which were pulled too close to the black hole. Sgr A*’s immense gravity simply shredded them, compressing them and causing the runaway reactions that lead to some of the largest explosions in the universe. But there’s still a puzzle with our galaxy’s core. Despite those supernovae, it’s quiet. Very quiet. Galaxies elsewhere are seen to spew out huge plumes of gas at speeds near the speed of light. So why is Sgr A* so silent? Well, some believe it’s just snoozing after it’s last big meal. Estimates are that Sgr A* was feasting just 300 years ago and kicking out a huge jet of matter while it did. How do they know? They saw it’s reflection in Sgr B2. Their theory is that a supernova remnant was being devoured at the time. Certainly in keeping with all of those remnants in this image. All in all, quite a turbulent neighbourhood, but one I certainly hope more people decide to take a closer look at. After all, it makes sense that if you’re going to look at supermassive black holes, why not look at the nearest one to us? This entry was posted in Imported from Livejournal and tagged black holes, galaxies, Sagittarius A, supernovae. Bookmark the permalink.